What does 888 mean when it appears in your life? The interpretation of this magical, spiritual number often depends on your life’s circumstances. One thing is for certain; forward movement is imminent. So, what is the meaning of 888? It’s a whole new, positive dynamic. Let’s explore to find out more! Where 777 denoted a kind of completion, 888 has even stronger symbolism. First, the digit 8 is double 4, which is a very stable digit, particularly with earthly matters. Double that, you are at eight, so money is not an issue. So, what happens when you triple the significance of “eight?” Abundance in all its forms seems to rain upon you! Such blessings don’t come simply by happenstance. You have done something in your life worthy of noticed from Sacred Powers. Your vision for your life is spot-on. Also, even though you stumbled a few times, you never gave up; this is your reward. Seeing 888 says you are in the right place, at the right time with the right people. It’s a tad overwhelming. When you see so much increase in your life, there may be a temptation to overdo it. Take care as that can move the rug right out from under you. Think and act carefully, and also with a little charity in your pocket. You know how experiencing misfortune feels. Help where you can but wisely. People encountering 888 are very adept at working for causes effectively if they have the right tools and people on hand. The vibrations in and around you are there as the backup singers at the most fantastic concert of your life. Harmony is spectacular. The timing just right. You feel as if you are part of the Song of the Spheres, if not in the center of it. There is a little bit of Karma at work here with all the best outcomes. These moments don’t come very often for most so greet it with a heart full of gratitude. Numbers are one way that Angels can get your attention and deliver essential insights. Triple numbers are one of the configurations people encounter. Seeing 888 Angel Number shows that a Guide (or two) has arrived in your life, taking you to the next stage. This Guide is part of your Universal team intent on supporting your spiritual self-actualization. Number 888 often comes to people who have reached a place of profound wisdom. They have “been there, done that” and carried important lessons from those situations. The beauty of this is that you can use your acumen not only for continued self-improvement but also in helping others that face struggles they cannot overcome alone; this is a symbiotic relationship, you assist them, they give you even greater insights through the experience. Angels know well the wonderful feeling of watching someone blossom when they were previously defeated. Having been Cosmic midwives for all manner of souls, it’s something Angels cannot help but smile about; They respect your efforts and are standing by offering more aid as needed. The second meaning for Angel Number 888 has to do with those things for which we wish, but that have potentially negative consequences. A person may crave notoriety, for example. That could come through their talents or a car accident. So, when you are thinking about your desires, it’s important to frame them in concrete, reasonable terms. Building on that Angels reminds us that while we are beings of infinite potential (8 is the infinity sign standing up), there are limits in terms of what we receive at any given time. We must be ready, willing, and able to use the gifts and blessings we receive, and many of those should come as a result of personal efforts – making good choices, or sowing seeds in fertile soil. When we waste proverbial seed to rocky ground, then what we get out of it won’t be much (if anything). Now, this usually isn’t purposeful, but now you have a chance to learn something and change your approach. Good intention, patience, and persistence are things the Universe rewards. Your actions send out little waves, so give them a heaping amount of love. The return ripple will be worth your time and focus. Third, in asking yourself, “What does Angel Number 888 mean for my life,” the answer is that your focus is starting a move toward Globalism. Your life’s spheres are moving in growth-oriented ways. Where once you may have lingered over a negative, now it’s momentary and followed by hope and trust; this, in turn, draws far better energies into our lives just as the Law of Attraction promises. While we might not always be able to control the circumstances in our lives, we can control the way we respond. Respond in unexpected and magical ways! Your shifting focus is akin to only the first of the three 8s in this Angel Number. The next two energize abundance. Wherever you are in your life, the Universe has you there for a reason. What you are given isn’t meant just for you. There’s more to it, and it’s your responsibility to figure out what that “IT” is. Angels provide guidance, but we still need to get to various states of awareness on our own two feet. Finally, when you think of abundance bear in mind that it is not always money. An abundance of peace is invaluable as is love. Let the Divine flow into the core of your soul and create harmony. In a spiritual framework, 888 is active. You cannot sit on life’s sidelines and expect anything to change. If anything, that’s likely to make you miserable over time. 888 is a signal to get up and get in gear if you’re not already. When you have goals, you have to work toward their manifestation. 888 is truly a number of BIG actualization. If you approach this time in your life correctly, the results astound everyone. Angel Number 888 is also a digit for balance. The number 8 consists of two circles resting one atop the other, representing the spiritual and physical world. One without the other topples. Unless a person is called to selfless devotion, we remain in the material world where we work, eat, worship, laugh and love. There is nothing wrong with material fullness, but the symmetry between your two worlds remains vital. Follow your bliss yet seek the Divine. Work on your career; maintain your ethics. Embrace your passion; know your power. Think gusto with a capital G in body, mind, and spirit. “G” also stands for GO! 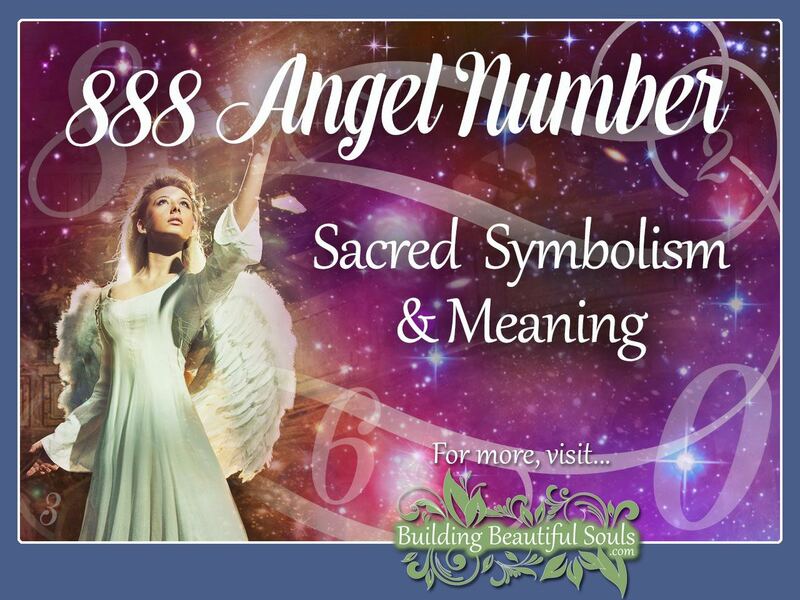 So, what does 888 Angel Number mean for your relationships and matters of love? First off, you will not want for good friends, enjoyable social situations, and even surprising turnarounds in difficult family matters. Reviewing the people in your life, you begin seeing connections and solutions that eluded you previously. If you have a dedicated relationship that’s been struggling – 888 indicates you have a great chance to fix things. Open the door and bring your Angelic backup crew. Remain sensitive to different perspectives and listen a lot. You can find common ground from which to build anew. Of most importance, however, is putting your partner before yourself at this moment. Angel Number 888 appearing also implies that you both need to take stock of what you bring to the relationship. What is it that each of you do best? Do you utilize those strengths? Knowing this also signals those times when you should reach out to your partner for aid rather than just muddling through alone. So, doing not only improves your relationship but can also result in a prosperous co-op effort. Numerology reduces 888 by adding all three 8s together (24) then adding 2+4 equaling 6. So, we can look at eight as a stand-alone number or the symbolic value of 6 for 888. Overall 8 means good things are coming your way. Don’t stop working on what’s at hand. Finish the task. Reach the end zone. That’s where the big “stuff” happens thanks to the personal energy and diligence you’ve invested. Now let’s compare this to six; this number signals the need for us to keep our focus positive. Attitude = outcomes. Your karmic slate is in flux, and it’s engaging you right now. There may be some struggles here but, in the end, the results are impressive. So long as you keep sticking with your truth, this whole situation irons out with a kind of rebirth that has “happily ever after” written all over it. Students of Bible Numerology believe that 888 is the number representing Christ the Redeemer through gematria. Each letter of the Greek alphabet has a digital value. When you add up those values in the name of Jesus, it results in a total of 888. Because eight corresponds with infinity, the 888 implies the infinite, boundless nature of the Godhead-Father, Son and Holy Spirit. Every day is a miracle, as much as that sounds like a simplicity. The attitude of Gratitude is one that makes life far more enjoyable. Appreciate those little things. Angel Number 888 repeating means that for us to maintain abundance, we have to maintain thanks. Life is fleeting but what you learn is eternal.